The recovery in diamond prices is leaving out the smallest and lowest-quality gems. 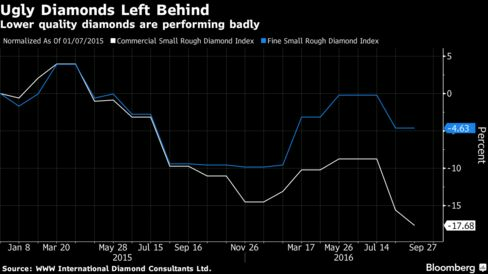 For the smallest diamonds, prices are down 15 percent this year, data compiled by Bloomberg show. That compares with an average 7 percent increase for all stones yet to be cut and polished. 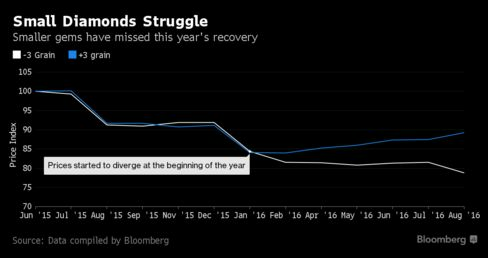 The overall market is recovering after De Beers and Russia’s Alrosa PJSC cut supply in 2015 to boost sales. The slump in gems smaller than three grains (0.75 carat) is partly a hangover of producer stockpiling, which left a “hefty supply” to sell in the first half, said Johan Dippenaar, chief executive officer of Johannesburg-based Petra Diamonds Ltd. Manufacturers are also turning more to bigger, higher-quality types which can be bought and sold faster, consultant Gemdax said. In addition, cheaper stones are those most threatened by the rise of man-made diamonds. Average rough-diamond prices slid 18 percent last year, the most since 2008, as slowing Chinese demand and an industry-wide credit crunch cut purchases. The slump prompted De Beers and Alrosa to hold back supplies to support prices. While there has been a general recovery this year, some mining executives and bank analysts have questioned whether the rebound will last. That recovery hasn’t stretched to all types. Among small diamonds, those classified as fine quality have this year outperformed so-called commercial stones, the poorer clarity varieties often off-white or brown in color. For cutters and polishers, it’s taking less time to generate a profit from larger stones than smaller ones. Many manufacturers who’ve seen their earnings squeezed have turned more to the bigger types to get a faster return on their capital, boosting demand, according to Anish Aggarwal, a partner at Gemdax in Antwerp. There’s also the specter of diamonds produced in laboratories, rather than being mined, looming over the bottom end of the industry. Though accounting for just a fraction of overall diamond sales, they pose the biggest threat to traditional poorer-quality natural gems because consumers can get a more attractive product. There is also concern in the industry that smaller man-made diamonds can be more easily passed off as mined stones. While man-made diamonds will pose a bigger risk if the diamond industry fails to spend more on promoting traditional types, they may also help lure more customers, Aggarwal said.